Indian Markets Spooked - India’s financial markets are in the throes of a bear hug. India’s financial markets are in the throes of a bear hug. And the core of the crisis that has shaved off Rs8.48 lakh crore ($116.33 billion) in investor wealth in the last ten days is Mumbai-based Infrastructure Leasing & Financial Services (IL&FS). The company recently defaulted on a few payments, which means it has run out of cash. This spells trouble not only for the firm but also for its investors, which include banks, insurance companies, and mutual funds. The situation is so grim that it is being compared to the 2008 Lehman Brothers crisis that triggered a global financial meltdown. Investors and traders have been worried sick over the cascading effects of IL&FS’s defaults. In September, the benchmark index Sensex has already shed over 2,000 points till now. Apart from envisioning and building infrastructure projects, IL&FS is also a “shadow bank.” The term is used to refer to the non-bank financial intermediaries that provide services similar to traditional commercial banks. Since these are not deposit-taking companies, they are not as stringently regulated, say experts. 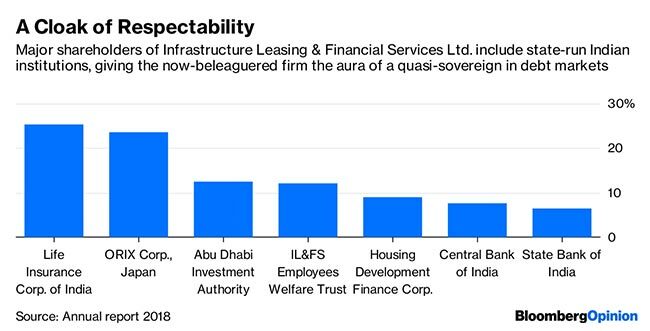 IL&FS sits atop a web of 169 subsidiaries, associates, and joint-venture companies that makes the default even more worrisome. State-owned Life Insurance Corporation of India (LIC), which owns a 25.34% stake in IL&FS, is its largest shareholder, followed by Japan’s Orix Corporation (23.54%). Other key shareholders are the Abu Dhabi Investment Authority (12.56%), Housing Development Finance Corporation (9.02%), Central Bank of India (7.67%), and State Bank of India (6.42%). To put it simply, IL&FS has run out of money and, therefore, has been unable to service its repayment obligations. Since Aug. 27, it has defaulted on around Rs450 crore of inter-corporate deposits (ICDs) to the Small Industries Development Bank of India (SIDBI). Earlier this month, IL&FS and its subsidiary, IL&FS Financial Services, also delayed payments on ICDs and commercial papers, instruments that mature in less than a year. As per the latest update, the company has a total consolidated debt of Rs90,000 crore. The recent slowdown in infrastructure projects has only worsened its situation. Additionally, IL&FS financial services has about $500 million in repayments which are due in the second half of this financial year while it has only about $27 million available. 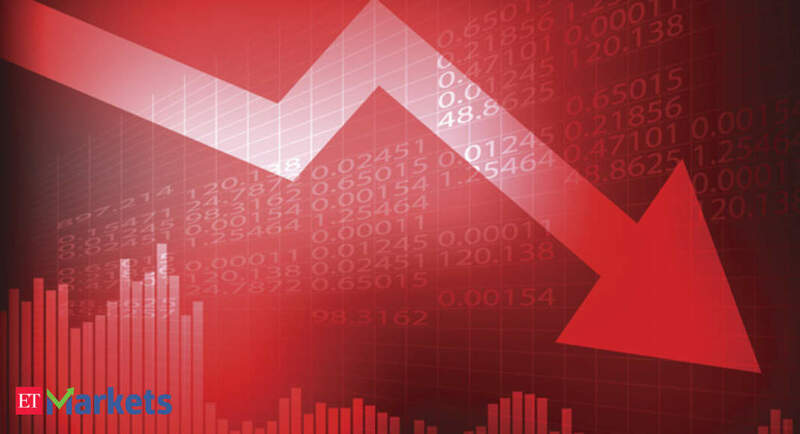 Not surprisingly, rating agencies, such as ICRA and Care Ratings, have downgraded the parent and its subsidiaries significantly from investment grade to junkearlier this month. A downgrade in the credit rating sends the bond’s price down which affects debt funds. What’s worse is that most of the group’s assets include financial claims on infrastructure projects such as roads, tunnels, water treatment plants, and power stations, etc. which cannot be liquidated to escape the mess. IL&FS’s defaults can have a significant impact on India’s credit markets. The firm’s outstanding debentures and commercial papers accounted for 1% and 2%, respectively, of India’s domestic corporate debt market as of March 31, according to Moody’s Investor Services. On the other hand, its borrowings from banks—around Rs57,000 crore—made up between 0.5% and 0.7% of banking system loans. Defaults will spell more trouble for Indian lenders, already battling a huge toxic loan pile. What is the company doing now? In dire straits, the company has already put its corporate headquarters, worth nearly Rs1,300 crore, on the block. It has also identified nearly 25 projects for sale. By selling these assets, it intends to bring down its debt by approximately Rs30,000 crore which is one-third of its total, but the process can take over a year. The Reserve Bank of India (RBI) is reportedly conducting a forensic audit into IL&FS’s books. The banking regulator, along with market watchdog Securities and Exchange Board of India (SEBI), released statements on Sept. 23 to allay investor concerns. “The RBI and SEBI are closely monitoring recent developments in financial markets and are ready to take appropriate actions, if necessary,” the statement said. On Sept. 24, the government also revealed that it is watching the situation closely. Since the defaults have been on commercial papers, it will affect individual investors, too. This is because mutual funds invest in them and these CPs are supposed to be relatively secure investments. Even the value of unit-linked insurance plans, endowment plans, the National Pension Scheme, etc. will be hit. There may also be some indirect effects. For instance, several projects, including the Bengaluru Metro construction plans, are likely to be delayed, which will affect individuals, too, besides the firms involved.